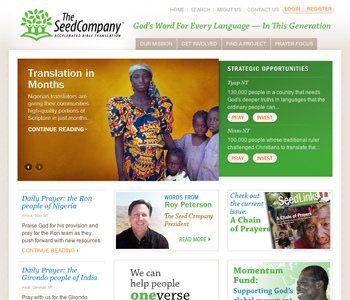 We redesigned http://theseedcompany.org to better communicate with the organization’s partners and potential partners by creating a compelling new look & feel, designing an approachable and intuitive information hierarchy, and deploying the website with a feature-rich CMS that provides efficient workflow and integration with internal legacy systems and authoring processes. The Drupal 5.7 installation features heavy workflow customizations to facilitate the organization’s pre-existing content development process, and is being used to manage workflow for print communications as well as web. The website integrates with internal systems to provide automated content creation and editing, real-time reporting on organization projects, and complete giving histories for investors.